In this tutorial I’m going to illustrate how to serve a JSON API using Go. I’ll create a basic backend for a Vue.js application that will serve data already present in a PostgreSQL database. I’ll have a single page application written using Vue in the browser. This app will list several Git repositories, and when clicking one of them it will show some details I elaborated elsewhere. The API I’m going to build in this post is read-only (no POST requests). /api/repo/:owner/:name will show the details of the repo identified by owner and name. You can think of owner and name as the usual github.com URL structure: github.com/owner/name. I’ll hook Go to an existing PostgreSQL database and serve a response based on the parameters passed to the request. This code already takes care of parallel processing of requests. Let’s add a PostgreSQL connection. Learn more about using a SQL database in Go if you are not familiar with the concepts. I won’t use any ORM or external libraries, just plain database/sql code. I introduce the initDb() function, which checks if those mandatory environment variables are set, and opens the connection to the database, panicking if something fails. The db package variable contains the connection, and I keep it always open until the program exists. 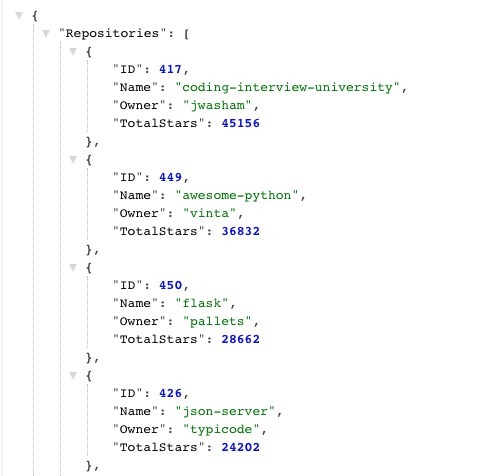 The /api/index endpoint lists all the repositories we have in the database. There is no pagination. 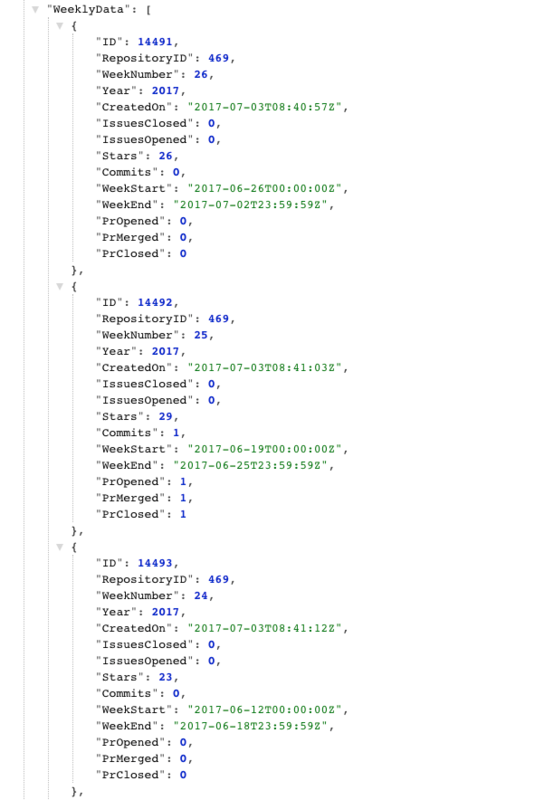 We need to do a query on the repositories table, which contains all the data we need, and add the data to the repositories struct, which will then be marshaled as JSON and returned to the client. In addition to /api/index, the app responds to /api/repo/:owner/:name requests. This means it discards any other format of URL request, like /api/repo or /api/repo/:owner or /api/repo/1/2/3. I just want 2 tokens, owner and name. Terminating with / the first parameter of the http.HandleFunc() call causes the handler to be called with URLs starting with /api/repo/, not just /api/repo/ like it does for /api/index. // parseParams accepts a req and returns the `num` path tokens found after the `prefix`. Sample usage: params, err := parseParams(req, "/api/repo/", 2). 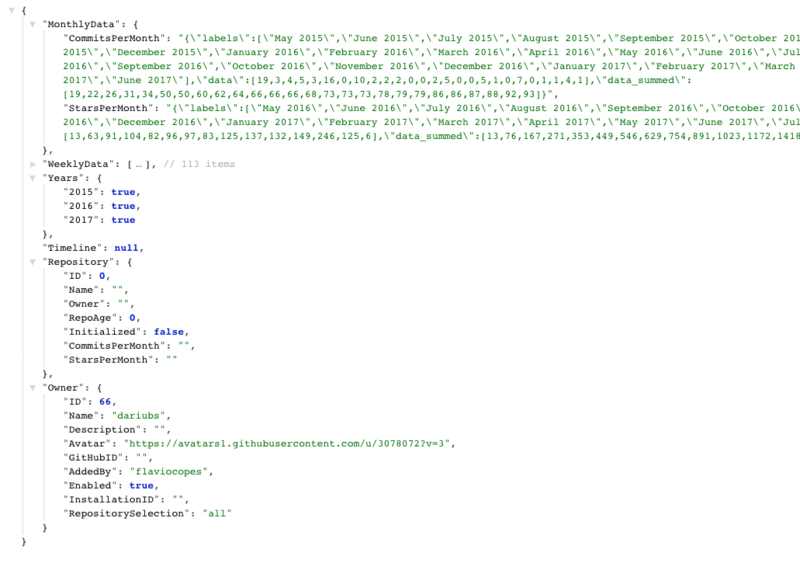 Generating capitalized properties in JSON does not look like “proper JSON”. But it’s perfectly valid. There is no standard naming of keys in JSON, and our format is called UpperCamelCase, also known as PascalCase. But many style guides want camelCase, which starts with a lower letter. Or maybe you have a standard of using snake_case. Of course this is just the starting point, we still have lots to do to make this a proper API endpoint, but we’re on a good track.